Important: This is the documentation for the Sentry service introduced in CDH 5.1. If you want to use Sentry's previous policy file approach to secure your data, see Sentry Policy File Authorization. The Sentry service is a RPC server that stores the authorization metadata in an underlying relational database and provides RPC interfaces to retrieve and manipulate privileges. It supports secure access to services using Kerberos. The service serves authorization metadata from the database backed storage; it does not handle actual privilege validation. The Hive, Impala, and Solr services are clients of this service and will enforce Sentry privileges when configured to use Sentry. The motivation behind introducing a new Sentry service is to make it easier to handle user privileges than the existing policy file approach. Providing a service instead of a file allows you to use the more traditional GRANT/REVOKE statements to modify privileges. The rest of this topic will walk you through the prerequisites for Sentry, basic terminology, and the Sentry privilege model. CDH 5.1.x (or higher) managed by Cloudera Manager 5.1.x (or higher). See the Cloudera Manager Administration Guide and Cloudera Installation for instructions. HiveServer2 and the Hive Metastore running with strong authentication. For HiveServer2, strong authentication is either Kerberos or LDAP. For the Hive Metastore, only Kerberos is considered strong authentication (to override, see Securing the Hive Metastore). Impala 1.4.0 (or higher) running with strong authentication. With Impala, either Kerberos or LDAP can be configured to achieve strong authentication. Sentry with policy files is added in CDH 5.1.0. Sentry with config support is added in CDH 5.5.0. Sentry with database-backed Sentry service is added with CDH 5.8.0. Implement Kerberos authentication on your cluster. For instructions, see Enabling Kerberos Authentication Using the Wizard. An object is an entity protected by Sentry's authorization rules. The objects supported in the current release are server, database, table, URI, collection, and config. A role is a collection of rules for accessing a given object. Note: In Beeline, you can also grant SELECT and INSERT on SERVER. A user is an entity that is permitted by the authentication subsystem to access the service. This entity can be a Kerberos principal, an LDAP userid, or an artifact of some other supported pluggable authentication system. A group connects the authentication system with the authorization system. It is a collection of one or more users who have been granted one or more authorization roles. Sentry allows a set of roles to be configured for a group. A configured group provider determines a user’s affiliation with a group. The current release supports HDFS-backed groups and locally configured groups. Sentry uses a role-based privilege model with the following characteristics. Allows any user to execute show function, desc function, and show locks. Allows the user to see only those tables, databases, collections, configs for which the user has privileges. Requires a user to have the necessary privileges on the URI to execute HiveQL operations that specify a location. Examples of such operations include LOAD, IMPORT, and EXPORT. Privileges granted on URIs are recursively applied to all subdirectories. That is, privileges only need to be granted on the parent directory. In Beeline, you can grant privileges on an object that doesn't exist. For example, you can grant role1 on table1 and then create table1. When Sentry is enabled, you must use Beeline to execute Hive queries. Hive CLI is not supported with Sentry and must be disabled. When Sentry is enabled, a user with no privileges on a database will not be allowed to connect to HiveServer2. This is because the use <database> command is now executed as part of the connection to HiveServer2, which is why the connection fails. See HIVE-4256. For more information, see Authorization Privilege Model for Hive and Impala. Sentry - Groups are looked up on the host the Sentry Server runs on. Hive - Groups are looked up on the hosts running HiveServer2 and the Hive Metastore. Impala - Groups are looked up on the Catalog Server and on all of the Impala daemon hosts. Group mappings in Sentry can be summarized as in the figure below. The Sentry service only uses HadoopUserGroup mappings. 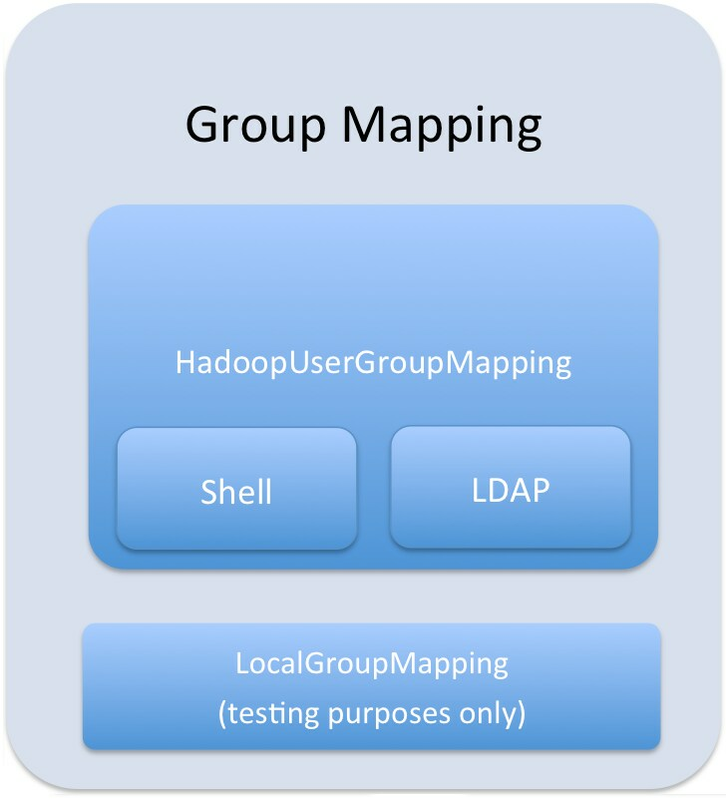 See Configuring LDAP Group Mappings for details on configuring LDAP group mappings in Hadoop. Privileges can be granted on different objects in the Hive warehouse. Any privilege that can be granted is associated with a level in the object hierarchy. If a privilege is granted on a container object in the hierarchy, the base object automatically inherits it. For instance, if a user has ALL privileges on the database scope, then (s)he has ALL privileges on all of the base objects contained within that scope. A user with role1 can create a view in database1 based on a table in database2. Because role2 has access to database1, a user with role2 can read the data in that view from database2. URI permissions do not affect HDFS ACL's. -This operation is allowed if you have column-level SELECT access to the columns being used. -Output includes all the tables for which the user has table-level privileges and all the tables for which the user has some column-level privileges. -Output includes an additional field for any column-level privileges. -You can grant the SELECT privilege on a view to give users access to specific columns of a table they do not otherwise have access to. -See Column-level Authorization for details on allowed column-level operations. The tables below refer to the request handlers defined in the generated solrconfig.xml.secure. If you are not using this configuration file, the below may not apply. admin is a special collection in Sentry used to represent administrative actions. A non-administrative request may only require privileges on the collection or config on which the request is being performed. This is called either collection1 or config1 in these tables. An administrative request may require privileges on both the admin collection and collection1. This is denoted as admin, collection1 in the tables below. Note: If no privileges are granted, no access is possible. For example, accessing the Solr Admin UI requires the QUERY privilege. If no users are granted the QUERY privilege, no access to the Solr Admin UI is possible.